Lynchburgers rose early Saturday, Feb. 2, for a surplus sale hosted by Liberty University’s Surplus and Resale Department, which offered retired university furniture to the community at heavily discounted prices. The usually quiet Liberty University Warehouse located on the corner of 12th Street and Campbell Avenue opened its doors for eager shoppers at 7 a.m. sharp. The sale, which ended at 10 a.m., offered chairs, desks, sinks, dorm furniture and other items of value no longer needed by the university. People of all ages braved the sub-freezing temperatures for the bargain sale, and everyone had a different intention in being there. Lynchburg resident Joshua Spencer said he came to buy retired dorm bunks for his sons. Katrina Diggs came specifically for chairs — she rounded up her choices, spread herself across the selection, and waited for another member of her party to pay. “I love coming to these sales because it’s just a great way to get good, quality furniture at some great prices,” customer Brett Sturgill said. Some of the attendees had been to several surplus sales, but many of them had never attended a sale. Both Spencer and Diggs said they found out about Liberty University Resale via its Facebook page. “We’ve had things for sale for a while, but people just didn’t know about us,” Jonathan Allen, assistant director of materials management, said. Prior to hosting regular sales, the resale department sold surplus furniture to the public several days a week. However, their offerings did not become popular until January of 2018 when the department launched its Facebook page. The department hosted its first sale in the spring of 2018 and garnered significant interest from the community. Many of the items are brought to the warehouse during remodeling or construction on campus. When offices are moved in new buildings, or dorms are torn down, all the furniture is brought to the 12th Street warehouse. Prior to offering surplus items to the public, the department keeps all the items in the warehouse for 30 to 60 days and allows university offices to browse the collection. 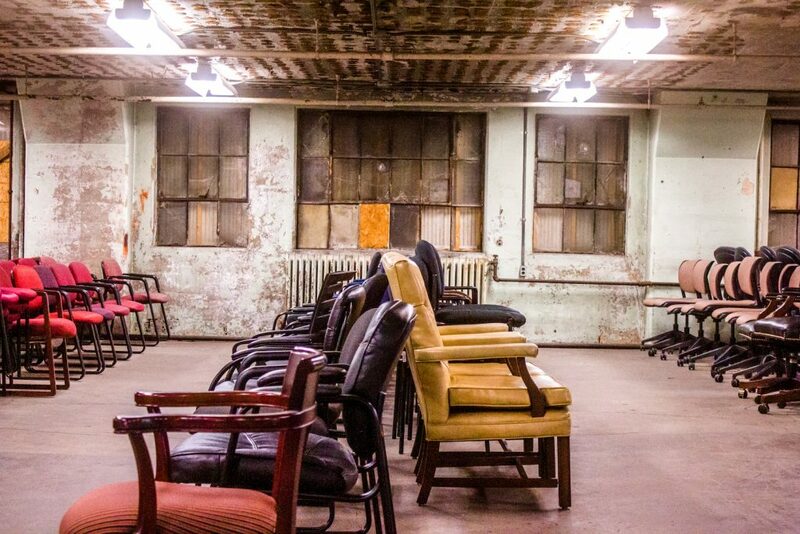 12TH STREET — Liberty’s warehouse has a three-step process: offer the furniture to other departments, sell it to the public and to recycle the materials, as a last resort. As a last resort, the department will sometimes recycle surplus items. However, they usually do not have an issue selling off surplus. Allen said they had trouble selling chairs once, so they marked stationary chairs down to $1 and rolling desk chairs down to $5. They completely sold out at the next sale. The six-story warehouse is also home to a variety of inventory that helps the university run smoothly. Niehaus explained that it serves as the central receiving facility for many of the custodial supplies needed by the university and provides storage space for recruiting events, homecoming and more. The university’s print shop is also located in the warehouse, and all the resources printed are stored on site. The resale department is planning to have sales every six weeks, with upcoming sales scheduled for March 16 and April 27. “With all the other stuff (we’re) doing, it’s too much for (us) to do more than what (we’re) doing right now,” Niehaus said. To help monitor questions coming in through social media, the department has a student worker who manages its Facebook page. In addition to offering more student work positions, the department hopes to expand its sales online to reach a broader audience. To keep up with Liberty University Resale’s upcoming surplus sales, follow their Facebook page, @LibertyUResale. SELL OUT — Many residents went home with dressers, chairs, tables and bunk beds.